Enlarge / New Horizons took this image of the Kuiper Belt object 2014 MU69 (nicknamed Ultima Thule) on Jan. 1, 2019, when the NASA spacecraft was 8,862km beyond it. The image to the left is an “average” of ten images. Enlarge / The “old” view of Ultima Thule is on top. 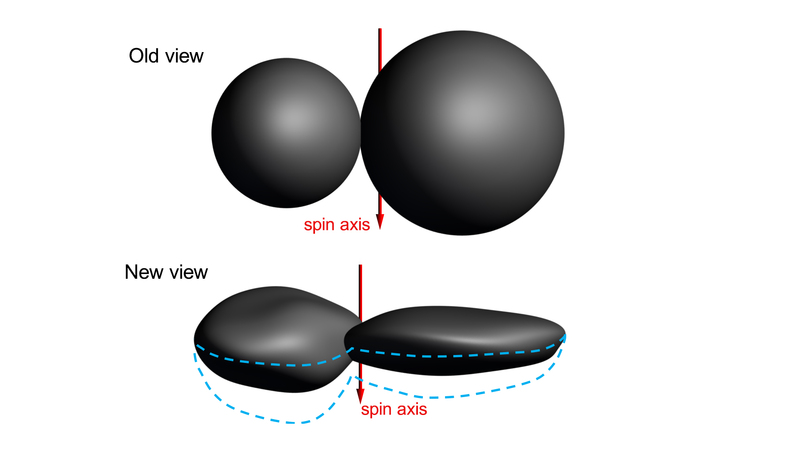 The bottom view is the team's current best shape model for Ultima Thule. The shape is not unprecedented. As planetary scientist Alex Parker noted on Twitter, “The larger lobe looks to have a shape similar to some of the pancake moons of Saturn, like Atlas.” However, Saturn's moons were believed to have formed near the gas giant, in the midst of its rings, rather than in deep space. New Horizons still has much more data to send back to Earth, as its data connection over the 44.4 astronomical units (6.6 billion km) is pretty slow. More data should help to resolve some of these questions as scientists study Ultima Thule. This is important, because this object, and others like it, are thought to be “pristine planetesimals” like those that served as building blocks for larger objects in the Solar System during its early days, 4.5 billion years ago.